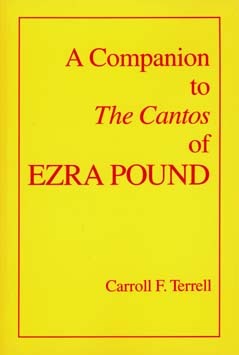 The Companion is a major contribution to the literary evaluation of Pound's great, but often bewildering and abstruse work, The Cantos. Available in a one-volume paperback edition for the first time, the Companion brings together in conveniently numbered glosses for each canto the most pertinent details from the vast body of work on the Cantos during the last thirty years. The Companion contains 10,421 separate glosses that include translations from eight languages, identification of all proper names and works, Pound's literary and historical allusions, and other exotica, with exegeses based upon Pound's sources. Also included is a supplementary bibliography of works on Pound, newly updated, and an alphabetized index to The Cantos. Carroll F. Terrell is Professor Emeritus of Comparative Literature at the University of Maine, Orono.